Kevin Zheng, a 10th grader currently studying with Kevin Lawrence at the UNC School of the Arts, is a resident of Cary, North Carolina. He started playing violin at the age of 7. He was soon well known in local communities with his debut in a Chinese New Year Gala at age 9. He has held several solo recitals, playing works by Bach, Barber, Bruch, Beethoven, and Wieniawski when he was studying under Richard Luby of UNC-Chapel Hill. He has collaborated with well-regarded musicians such as Dmitri Sitkovetsky, Eric Larsen, Shiela Browne, and Tim Fain. He has also performed with multiple symphonies in North Carolina. His performance of Paganini’s First Violin Concerto was highly recommended by the Classical Voice of North Carolina as demonstrating “amazing technical competence, musical sensitivity, and a commanding stage presence”. 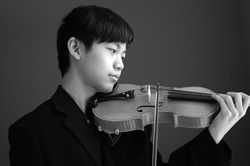 Kevin has received numerous prizes in concerto competitions and has been selected to compete in the 2010 Menuhin International Violin Competition in Oslo, Norway.